OKLAHOMA CITY, OK – The 73rd annual Bachelors Club Christmas Ball held on Thursday, Dec. 22, raised $35,000 for Sunbeam Family Services. Founded in 1907, Sunbeam is an Oklahoma City organization that offers a variety of programs to individuals and families of all ages, including early childhood, foster care, counseling, and senior services. Club President Cole Terlip selected this year’s beneficiary. Souled Outplayed the music for the evening, and after the debutante presentation, debs, escorts, their parents and guests danced around the Oklahoma City Golf and Country Club’s floor-to-ceiling Christmas tree in the Great Hall and enjoyed a late-night breakfast of waffles, bacon, biscuits, sausage, and fruits. The Bachelors Club also honored longtime supporter Clay T. Farha with its highest award, the Walter Powell Award, traditionally given to an alumnus (or another individual) that has shown loyal support and exemplifies the ideals of the club. Farha is president of B.D. Eddie Enterprises and its sister companies, which have been family-owned and operated in Oklahoma City since 1908. The firms primarily focus on real estate, oil and gas and financial investments. According to tradition, a group of young women in college – numbering 28 this year – made their debut escorted by members of the Bachelors Club. Decorations included the Club’s wonderful decorations – including an array of Christmas trees in the club’s foyer. 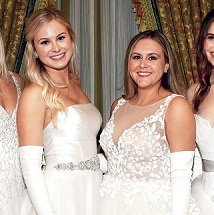 Floral arrangements by The Fleuriste House of Botanical Chic in Oklahoma City included frosty blue tablecloths, white floral arrangements, and a floral arch of white roses and hydrangeas that the debutantes and escorts walked through when they started the presentation. The Bachelors Club of Oklahoma City was founded in 1938 by a group of young men who wished to promote the social and philanthropic undertakings as well as leadership in the Oklahoma City area. The debutante presentation began in 1945 as a way to raise funds for various Oklahoma City charities.